Radnor Bridge: Does a Richmond College student have the answer? Does a Richmond College student have the answer? In an edition of the Twickenham Tribune, which came out this week, we noticed an interesting article about plans to use some of The Heritage Lottery Project to look at outdoor swimming in the London Borough of Richmond upon Thames. Local architecture students at Richmond upon Thames College have visited outdoor pool sites in Twickenham and Reading. They have then developed their own creative ideas. And it is fair to say they have come up with some interesting architectural styles. Models and drawings of their final designs will be exhibited at the college this summer and you can check out the college website for further information nearer the time. Why is this of interest to the Radnor Bridge initiative I hear you ask? Well, one of the students (Cameron Liddy) has proposed a replacement bridge for Eel Pie Island. Given the recent flooding, which has caused the existing bridge to become inaccessible at times, this would seem like a welcome idea. However, we noticed in the last sentence of the article there was a suggestion the proposed architectural design might also suit the Radnor Bridge location. After a little consideration we would like to respectfully say that in our opinion it unfortunately does not. The Radnor Bridge idea exists in response to its chosen geographic location. That is; the topology of the land is very well suited to a river crossing that needs to clear sailing masts underneath. Provided access to the Radnor Bridge is granted from a new mini-roundabout to be installed adjacent to the two schools on Cross Deep and opposite Popes Grove, there is no need for dramatic rises in height as the bridge crosses the river. A requirement that the Eel Pie Island position imposes on any bridge design considered for its location. This is important to us because we want to create a Thames river crossing that will provide easy access for all pedestrians and cyclists. While integrating perfectly with its surrounding transport infrastructure the bridge should also makes crossing the river quick and simple for the largest number of people in the borough… while also adding something special to the landscape in which it sits. To better understand why Radnor Gardens is the desired location for the RadnorBridge, why not revisit our top five pointers on this subject here. 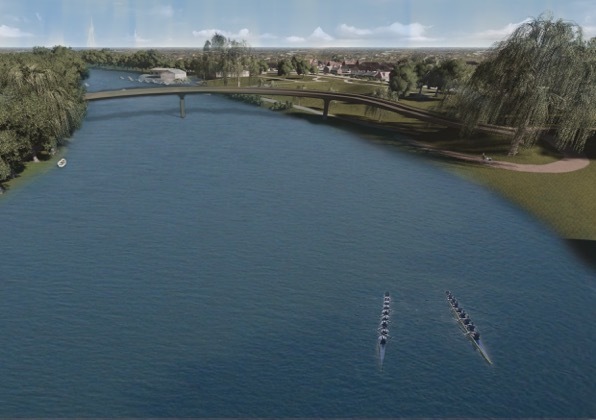 Back to the architectural project being proposed above; If the students and their teacher at Richmond College would like to explore ideas for the Radnor Bridge project then, as a separate project, we would be very happy to share our thoughts on the design brief. It would be interesting to see what they can come up with if considering this as a 'new' project. Thank you for taking the time to look at my design. I would like to point out that at the time this article was written/published I had not in fact finished the designing. The sketches showing my design were not accurate or to scale as it was a rough sketch. My course ended in the following May, since then the bridge's measurements and exact shape had been applied and the height of the bridge (based on the footbridge from Twickenham to Eel Pie) is more suitable for boats. If you would like to see the final design I would be happy to send it. The design was intended as either a replacement of the footbridge from Twickenham to Eel Pie, or as a new bridge.